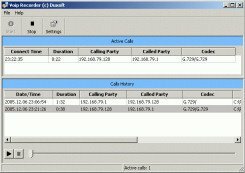 Sniffing network traffic, VoIP Recorder from Duxoft is able to extract voice packets (H.323, SIP, MGCP) and store decoded audio data in WAV files. Due to sniffing technology used by the product you can record remote calls inside the local network no mater if the calls are between hardphones or softphones. In a hub type network this kind of sniffing doesn’t raise any difficulties. But nowadays almost any local network uses switches instead of hubs. These devices provide an extra level of security and performance through their intelligent mechanism of distributing the data flow only to devices that participate into communication. If the VoIP Recorder is used legally then you may activate Port spanning on your network switch (as Duxoft recommends). ‘Hackers’ out there may also benefit of this software by poisoning the switch through an ARP attack. Although useful for some, this software may raise for others the issue of securing the VoIP communications. Without a proper VoIP encryption scheme anybody (I’m talking here about regular people not computer literate or hackers) on your local network may tap in your phone calls.